resident Thabo Mbeki takes his visits to rural areas very seriously. In fact when he talks to people during his one-to-one encounters as part of government’s Municipal Imbizo Programme, he carefully writes down the concerns people raise and their ideas on how to solve problems. The President, along with other government ministers, has been visiting municipalities to directly interact with the managers, with the councillors and with the residents. The programme aims to improve municipal service delivery and to get residents’ comments on the decisions that affect their lives. Many municipalities are doing well, but many face problems and don’t have the capacity to fix them on their own. Project Consolidate is a national programme for national and provincial government to help 136 municipalities that need assistance in delivering basic services such as water, electricity and sanitation to their communities. The past months have seen some communities taking to the streets for better services. In Phomolong in the Free State hundreds of residents protested against the continued use of the bucket system. In the Western Cape, residents protested against “corruption” in the allocation of the houses by government. In Reiger Park in Ekurhuleni residents were furious about selective electricity cuts. Almost all the affected areas have been ones that Project Consolidate had already identified as needing help. Even though Mbeki was confident that corruption and fraud could be prevented, he criticised councillors who failed to report back to communities. “Our local councillors must always report back to you (communities) the decisions that have been taken by councils. If councillors failed to inform communities about the projects the municipalities have in store for them, there will always be protest marches against municipalities,” Mbeki said during an Imbizo at Libode village in the Eastern Cape. Together national, provincial and local governments, along with private sector partners are working to overcome problems in service delivery to communities. Getting it right will also need citizens to participate. Department of Home Affairs made the life of 71-year-old Frances Mangcoya a lot easier. She was able to get a birth certificate for her grandson. “We support plans to bring services to the rural communities.” Reiger Park resident Maria Stenford said they protested after the council refused to cancel their bills or allow them to make easy arrangements to pay. “They want us to pay between 10% and 20% of the money we owe for electricity and water, but we cannot afford that because we are not employed. Thozamile Guduza (50) of the Eastern Cape registered her two granddaughters for grants. “I have waited long for this chance to register my grandchildren for child grants. I want to buy them school uniforms and good food,” she said. Project Consolidate is a national programme to help 136 municipalities that face problems to deliver basic services such as water, electricity and sanitation to communities they serve. Cabinet approved a programme for ministers and deputy ministers to work with provincial and local leaders to help struggling municipalities. “The aim is to improve service delivery at these municipalities,” government spokesperson Joel Netshitenzhe said. 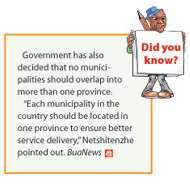 Government has also decided that no municipalities should overlap into more than one province. Great strides have been made in providing clean water and the scrapping of the bucket system. The department of local government in Mpumalanga has provided clean water to 11 struggling municipalities and widely eradicated bucket toilets in the past year. The department’s recent Project Consolidate report indicates that the province has also been busy providing refuse removal equipment, developing anti-corruption strategies, establishing ward committees and recruiting 48 community development workers. In Mpumalanga, 18 of the 23 municipalities fall under Project Consolidate. Provincial local government spokesperson Simphiwe Kunene said that the department had repaired 21 boreholes and drill two new ones in the rural areas of 11 municipalities. The department has bought 37 water tanks for six municipalities. Mr Kunene said the municipalities getting emergency water supply were Delmas, Steve Tshwete in Middelburg, Greater Tubatse in Burgersfort, Albert Luthuli in Carolina, Marble Hall, Emakhazeni in Belfast, Mbombela in Nelspruit and Thembisile in KwaMhlanga. “We have also awarded more than R12-million for the purchase of refuse removal trucks in Albert Luthuli, Nkomazi, Thembisile, Lekwa [Standerton], Emalahleni [Witbank] and Greater Tubatse,” he said. Seven municipalities were at different stages of eradicating unhygienic bucket toilets, which have been the source of water-borne diseases such as cholera, diarrhoea, dysentery, typhoid as well as worm infestations and eye infections. The bucket toilets, of which there are 15 891 in the province, are being replaced with ventilated improved pit toilets (VIP) and water borne toilets. Municipalities that still have these toilets are Dipaleseng (Balfour), Lekwa (Standerton), Msukaligwa (Ermelo), Albert Luthuli, Govan Mbeki (Secunda) and Delmas. All bucket toilets have been completely eradicated in Dipaleseng, Kunene said. Young people are trained by the Moses Kotane municipality in Mpumalanga to build houses. They are taught skills such as bricklaying, painting, plastering and roofing. Housing manager Vuyo Metele says the municipality has been working with the Labour Department, which funded the project. One of the beneficiaries, Jacobeth Rasepai (42) stays at Lesetlheng village, adjacent to Pilanesburg National Park. Today she can talk about her first-hand experience with confidence. Rasepai says she likes building and chose a course in bricklaying. Before the programme, she was unemployed. She stays with her mother, who is a pensioner, and her 16-year-old daughter. Now that she is taking part in the housing construction project and is receiving an allowance, tings at home are getting better. Access to water means more crops. More crops mean more food. The National Council of Provinces (NCOP) was impressed by the poverty alleviation community projects in the Mbonambi municipality in KwaZulu Natal. NCOP chairperson James Mahlangu praised the five-year-old local municipality for its “organised way of service delivery”. Mahlangu’s comments come after the NCOP’s visit to some projects in the area as part of afact-finding and review mission. “Given that it is five years old its efforts are commendable. There are now proper offices for officials,” said Mahlangu. The delegation visited the Mthethwa project, where women run a vegetable and farming initiative for the community. The project is two years old. It was pointed out that while the project was doing well, it could improve if there was access to water for the crops. Mbonambi Mayor Mkhonzeni Mthethwa undertook that water and other services will be provided to sustain all projects. Mahlangu said the visit, which included stop-overs at schools, was encouraging.